Ben Maher (GBR) has secured a hat-trick of wins so far in the Longines Global Champions Tour - Longines Paris Eiffel Jumping, adding tonight’s thrilling jump-off class to his list of successes in the French capital city. As the British National Anthem rang out for a third time this weekend, Maher stood proudly with Explosion W, the nine year old chestnut horse proving his talent, scope and consistency at the highest level of the sport. The Olympic gold medallist was presented his award this evening by Longines Vice President and Marketing Director Juan-Carlos Capelli and Longines Ambassador of Elegance Aishwarya Rai Bachchan. The pair took the lion’s share of the €100.000 prize purse, finishing ahead of French rider Nicolas Delmotte (FRA) and Urano de Cartigny, and World Number 1 Harrie Smolders (NED) with Zinius. 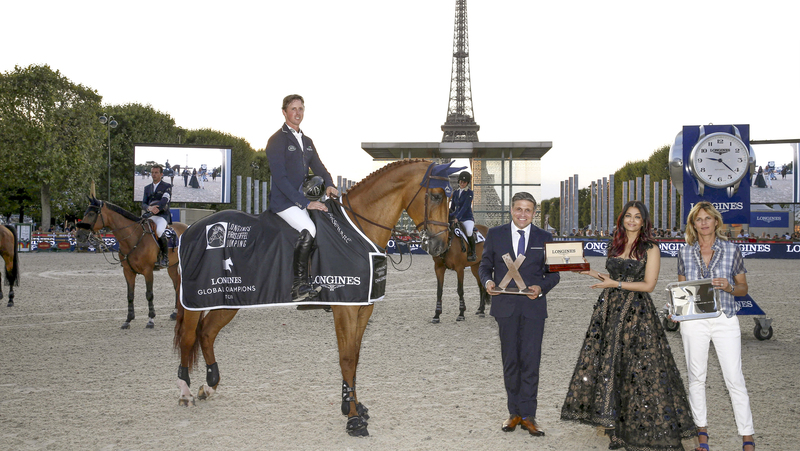 As the sun began to set behind the Eiffel Tower, basking the arena in soft golden light, 48 of the world’s top international horses and riders took centre stage in the €100.000 CSI5* 1.50/1.55m Longines Eiffel Challenge. Uliano Vezzani put together a challenging and technical course, featuring plenty of related distances. The unique aspect of the Paris arena is its square shape, rather than rectangle or oval, making for shorter distances and disrupting the rhythm in the lines. A hefty double of oxers caught out many of the combinations, and a Renault plank set along the expansive VIP also claimed a few victims. But faults fell all around the arena, proving this class would be the perfect prelude to tomorrow’s LGCT Grand Prix of Paris. First to go clear was 2017 LGCT Champion and World Number 1 Harrie Smolders (NED), putting in a masterclass of a round with the brilliantly quick Zinius. Ben Maher (GBR), who looks to be on incredible form after two wins so far this weekend, powered the 9 year old Explosion W clear, earning themselves a place in the jump-off. He would be joined by Olivier Philippaerts (BEL) with Extra, Jessica Springsteen (USA) with RMF Swinny du Parc, Henrik von Eckermann (SWE) with Flotte Deern and Karel Cox (BEL) with Evert. Local spectators would see hopes of a home win rise after Simon Delestre (FRA) with Chadino put in a flawless performance to ensure at least one French rider would be in with a chance for top honours. He would be joined by Nicolas Delmotte (FRA) and Urano de Cartigny, doubling the chances of a French win. So it would be an 8 rider jump-off with World Number 1 Harrie Smolders (NED) leading the field. Smolders pulled out all the stops, putting in a brilliant roll back to the gappy vertical and galloping to the finish to turn up the pressure with a time of 37.75s. Another early danger, Ben Maher (GBR) and Explosion W brushed that pressure off their shoulders - putting in a fluid and fast round, shaving a full two seconds off Smolders’ time to set the new time to beat at 35.30s. There was heartbreak for Jessica Springsteen (USA) and RMF Swinny du Parc, the duo up on time by half a second with the smoothest of turns around the flowing course, but agonisingly clipping the final fence. Their time of 34.91s was quicker still, showing there was the potential for the win to be taken from Maher. Temperatures soared after Olivier Philippaerts (BEL) took some chances with Extra, the powerful horse eating up the distances in his stride. But again the final fence fell, dropping the popular Belgian rider down the order, despite his strong time of 36.21s. The same pole dropped for Henrik von Eckermann (SWE) with Flotte Deern, meaning they too would be out of contention. There was disappointment for Simon Delestre (FRA) and Chadino after the second part of the double came down, and an early fence for Karel Cox (BEL) with Evert put them out of the running for a top three position today. Final rider to go, Nicolas Delmotte (FRA) and Urano de Cartigny, entered the arena to cheers from local spectators. Setting off at a gallop, the pair had a lucky rub, and shot around to the final line. They looked close to the win, with fans on the edge of their seats to see the finish time, but it wasn’t quite enough, slipping behind Maher in second to finish in 35.41s. So it would be a hat-trick of wins so far for Great Britain’s Ben Maher, with all eyes on tomorrow’s GCL Paris final and Longines Global Champions Tour Grand Prix of Paris which kick off at 16:00 and 19:15 respectively.